Killer Characters: Fishing for Love -- the Spice Shop Mysteries Return! Fishing for Love -- the Spice Shop Mysteries Return! Fish. You know, they don’t actually smell bad, unless they’ve gone bad. And I should know. Every day for the last — gosh, nearly a year now, since I bought the Seattle Spice Shop in the Pike Place Market — I’ve been walking by the Market’s four fish markets. I’ve become something of an expert in the sights and smells of the fishmongers’ stalls. If you’ve been to the Market, you’ve probably stood near the entrance on Pike Place, by Rachel, the bronze pig that serves as the Market mascot as well as its piggy bank and the perfect place to snap a picture of your kids, and watched men throw fish under the big clock. “Salmon for St. Louis!” they’ll cry after one of them takes an order and finds out where it’s going. “Halibut for Helena! Crab for Colorado!” If they ever miss and drop a chunk of coho or send a slab of sole the wrong direction, I’ve never seen it. But there are other fish sellers in the Market, too, less flamboyant but just as tasty. They’ve each got their specialties – their fish niche – and their following. At Seattle Spice, we’ve got all the herbs and spices you need to accentuate those flavors and fill your kitchen with the sweetest scent of all: Good food, made with care and served from the heart, for the people you love. Come on in. We’re open. You never know what the Catch of the Day might be. Got a favorite fish or a way to prepare seafood? We’ve been playing with seafood blends I bought on my last trip to Seattle, and I’m especially fond of a lemon-basil blend on flaky white fish! Seattle Spice Shop owner Pepper Reece probes murder while juggling a troubled employee, her mother's house hunt, and a fisherman who's set his hook for her. As owner of the Spice Shop in Seattle's famed Pike Place Market, Pepper Reece is always on the go. Between conjuring up new spice blends and serving iced spice tea to customers looking to beat the summer heat, she finally takes a break for a massage. But the Zen moment is shattered when she overhears an argument in her friend Aimee's vintage home decor shop that ends in murder. Wracked by guilt over her failure to intervene, Pepper investigates, only to discover a web of deadly connections that could ensnare a friend - and Pepper herself. Leslie Budewitz is the author of the Food Lovers’ Village Mysteries and the Spice Shop Mysteries—and the first author to win Agatha Awards for both fiction and nonfiction. Her first historical short story, "All God's Sparrows," is nominated for the 2018 Agatha Award for Best Short Story; read it on her website. 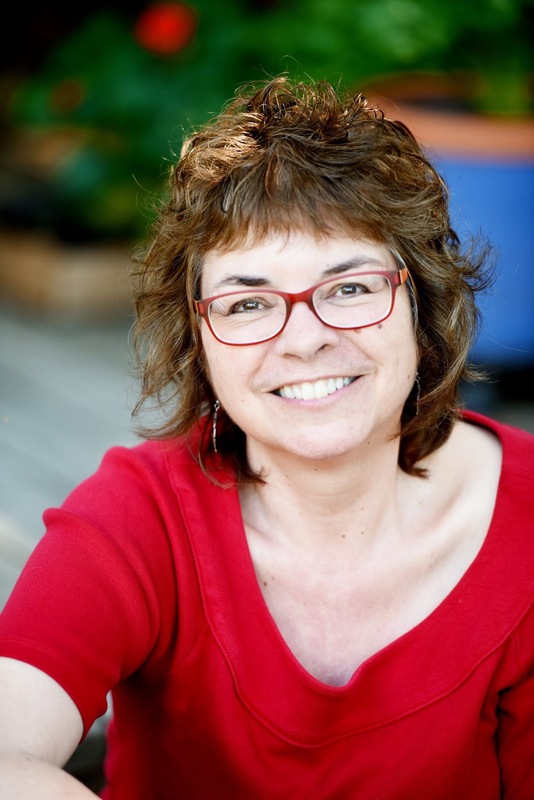 A past president of Sisters in Crime and a current board member of Mystery Writers of America, she lives in northwest Montana with her husband, a musician and doctor of natural medicine, and their cat, an avid bird-watcher. Hey Leslie, I'm thrilled that this series is returning. I love the characters and the location of the stories. I've also added the release date to my June New Titles Release list which will be posted on my blog site on MAY 15TH. I’m so excited that Pepper is coming back. I can’t wait to read Chai Another Day! Thanks! I must say, I do think it's a good story and I'm so happy to be writing Pepper again! Yay! Oh, the anticipation ...! As co-owner (with my husband) of a fairly extensive spice cabinet, I really love this series. Husband is crazy enough to make his own spice blends (ras al hanout, garam masala, ta'aza masala, etc.) - and cooks with them! Ooh, making blends is such much fun! As you know, each Spice Shop book includes at least one blend recipe. Thanks for keeping it spicy! 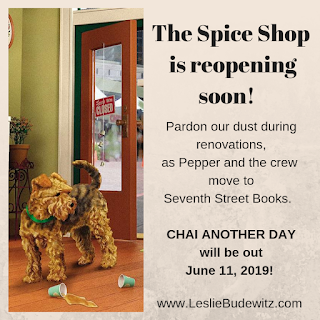 I love the Spice Shop mysteries! So glad to hear there is another one coming. Thanks! And I'm 58 pages in to #5! Looking forward to this series return!! Pepper and I thank you! I love these books! I am glad more are coming! 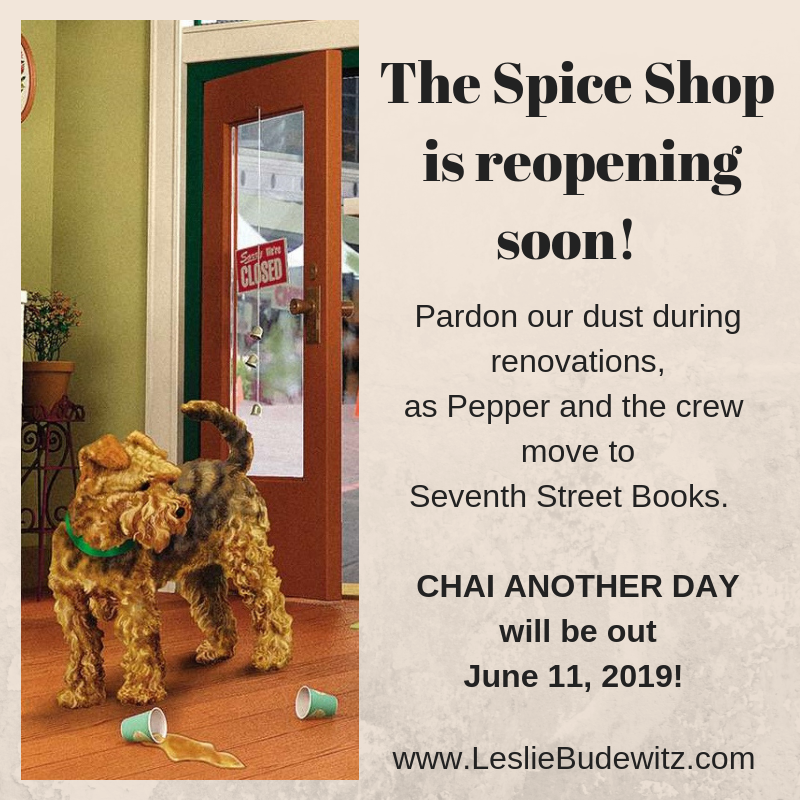 Pepper lives to (sorry) Chai Another Day! Cool! Reopening!!! Happy to know this!